Back in MY day, we had to carve ourselves... and we didn't have any of those fancy knives either....we had to use our OWN HANDS! "And we ate at Hardee's, dammit! I still use my hands - those little scoops are for weenies. he did like "a day in the life of a Halloween Jack" photo shoot!!! So Cool. one minute the jack is on different parts of the porch..he's hanging w/dogs..hanging w/ cats..then he's inside chillin on a chair in the living room..he's sittin on a bed(nice quilt)..then he's taking a nap..HHAHAHAHAHA!! 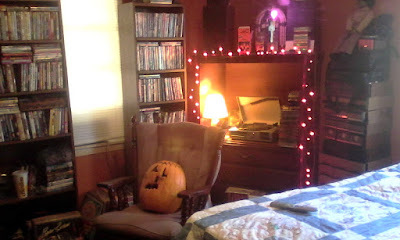 !..he's sittin on top of the tv..looking out the window..posing with his carver/buddy..visiting a field.. hahahaha. SO good. a Jack's Life!! i really dig the jack's carvings too. def unique. may FAVE shot i think is him just chillin on the chair w/ the twinklies. just SO sweet. really feels like Halloween..so homey.